Kanto Karaoke Video Creator allows you to easily create video karaoke from your MP3+CDG Karaoke files! MP3+CDG (named also MP3+G) is a karaoke file format that was created to allow CD+G karaoke disk to be played from a PC easily and quickly. MP3+G is the combination of the MP3 audio file and a raw CDG file which contains the song’s lyrics. Why Convert MP3+CDG to Video? The main raison is that video karaoke can be played on all mobile devices and on Smart TV. You do not need to install other software to play video files. How to rip karaoke songs from CD+G disc? STEP 1. 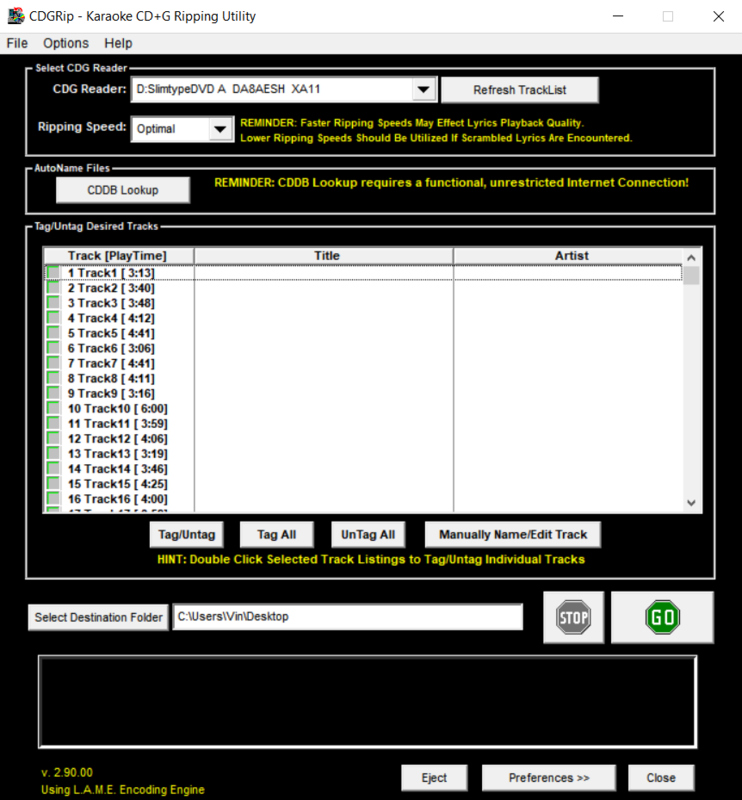 Click Here to download CDGRip. Then install and open the tool. STEP 2. Open CDGRip and it will automatically read the CDG disc (if it is already inserted in the CD player of your computer).You will see all tracks in the list. STEP 3. 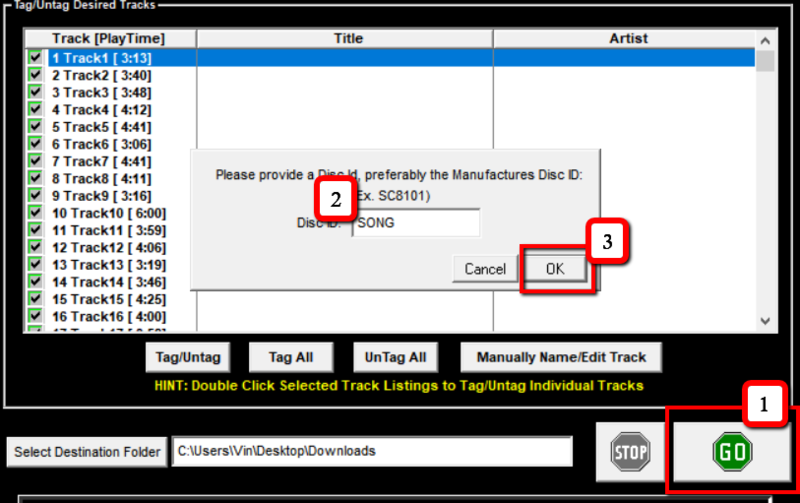 Click on TAG ALL button to select all tracks and select the Destination Folder. Then click on GO (green button). It will open a window where you can type a word like “SONG” and finally click OK. The software will begin to rip all mp3+g songs from the disk and saving them to the destination folder you set before. You have now to wait 4-5 minutes. Once all tracks will be extracted from the CDG disc, you will have two files for each song: a CDG file (Lyrics) and a MP3 file (audio). How to convert MP3+CDG (MP3+G) to Video Karaoke? If you want to convert these mp3+cdg files to AVI, MP4, or any other video format, you can use Kanto Karaoke Video Creator. The trial version will allow you to convert the first 60 sec of your mp3+g files to video. To remove this limitation purchase the license. Click on “Browse” to add the mp3 or cdg file that you want to convert in video karaoke. Be sure that both mp3 and cdg files are in the SAME folder on your PC (and not on external disk). The program automatically matches the mp3 and the cdg file. Before the CDG to video conversion, you can add an image as background. Click on “Browse” to select the image from your PC. The image will be displayed on the right. Choose the output folder, the output filename and finally click the START button. I converted my cdg’s to video. How do I get them on my mobile devices and Smart TV? Can this system be used to do a bunch of files at once or only individually? 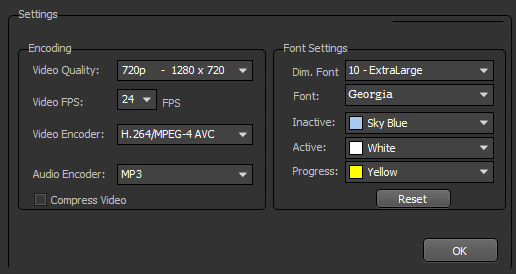 How can you convert a CDG to MP4 without losing its original background? i.e, no background? 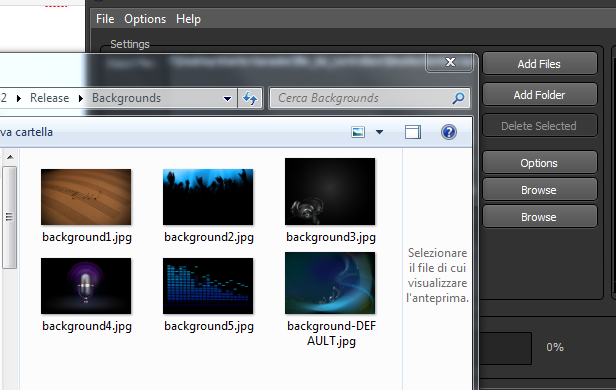 MP4 is a video format that preserves and “captures” the CDG background. I have my files on my computer. They are separated as a CDG and a MP3 file which is in a folder for each song. If I upload the CDG file into this program how will it pull the audio? I would have thought there would be an input for both the MP3 AND the CDG to make a video file. Please explain. Thanks. The software automatically matches the file CDG to the MP3. So you have to upload the cdg file or mp3 file only in the program. The important thing is that both cdg and mp3 files are in the same folder on your PC (and not on external disk). After converting cdg+mp3 files into mp4 files I have on the mp4 files only one audio channel left. So the stereo is gone. What went wrong? But, if my Singing Machine Fiesta Plus requires MP4 format, then I cannot use AVI as Output format, right? Also, I assumed that the original CDG was basically just a temp file, used to convert to MP3 using CDGRip. Then Step 2 was to use Kanto Video Creator to convert the MP3 to MP4. So, the only file needed on the thumb drive in the end would be the MP4?? Yes, you need to export file to MP4 formato for you Singing Machine. If the MP4 is not compatible with your SM, please contact us to info@kantokaraoke.com and we will send you a new version of the program, specifically designed to create MP4 for Singing Machine. I converted my cdg +mp3 to mp4 and it won’t work on my tv trough my karaoke machine I put them on a USB because my karaoke machine is digital. How can I fix this? and is it possible to change the key? I was really hoping this worked good. I have a lot of files I want to convert to use in my daughters Sing Machine. Granted, this is a trial version, but I won’t buy it if it does not work. The files are on my hard drive and not external. What am I doing wrong? If I convert my files with this program will I be able to play them on my iPad?